Decorating for a soccer themed celebration? 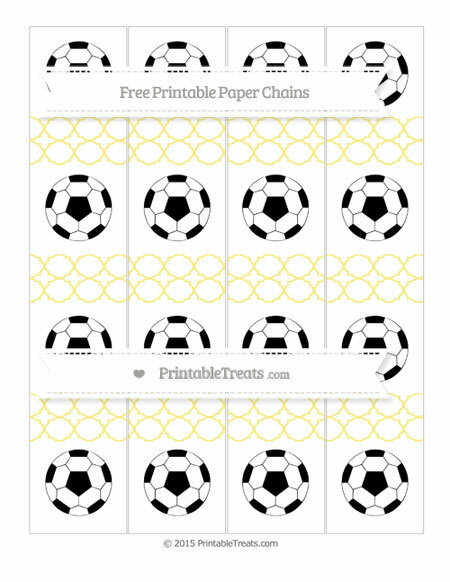 Here’s a cute set of pastel yellow quatrefoil pattern soccer paper chains you can download and print for a soccer birthday party or team sports party. This super cute soccer paper chain set has four paper chains on one page. They are decorated with alternating blocks of color and black and white soccer balls. These paper chains are a fun activity for children to put together on a rainy day or to help create decorations for a birthday party or children’s room.